Can you discover the 9-letter word used to create this brain teaser? 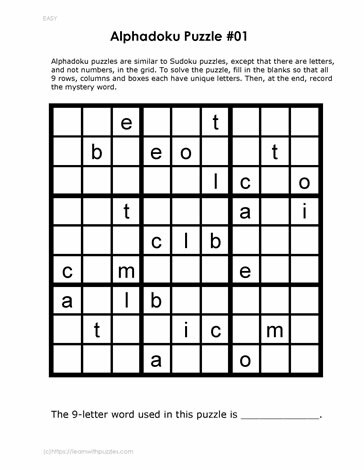 Alphadoku puzzle uses a unique 9-letter word to create the puzzle. Solvers need to use logic reasoning skills and problem solving strategies to solve this puzzle. Once completed, record the 9-letter word in the space provided. Sometimes, it is not as obvious as it seems because the word is made up of 9 different letters! Suitable for students in middle grades 5,6,7 classrooms and home schools to support logic and reasoning skills.